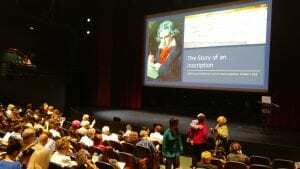 Guests gathered for a lecture and concert at the Hammer Theatre to celebrate the Ira F. Brilliant Beethoven Center’s acquisition of a rare first-edition score. 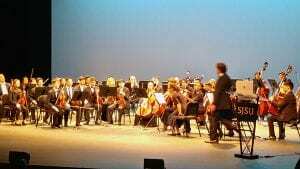 San Jose State University’s Symphony prepares to play Beethoven’s Seventh Symphony. Guests look at an exhibit of the hand-inscribed score after the concert. The Ira F. Brilliant Center for Beethoven Studies and the School of Music and Dance celebrated its acquisition of a rare first edition of Beethoven’s 7th Symphony that contains a personal inscription from the composer himself to Antonie Bretano with a performance of the piece at the Hammer Theatre Oct. 6. Incoming Director of the Beethoven Center Dr. Erica Buurman started the event with a pre-concert lecture at 2:30 p.m., followed at 3 p.m. by a performance of the piece by the SJSU Symphony Orchestra and conducted by Director of the School of Music and Dance Dr. Fred Cohen. The score and several other items will be on display Oct. 8 through Dec. 15, Monday through Thursday, from 11 a.m. to 6 p.m., Friday, from 11 a.m. to 5 p.m. and Saturdays, from 1 to 5 p.m., in the Beethoven Center, Room 580, in the Dr. Martin Luther King, Jr. Library. SJSU was able to bring this extraordinary musical artifact to campus after Patricia Stroh, curator and interim director of the Beethoven Center, learned that the first edition was part of a private collection. Working with the American Beethoven Society, SJSU’s Beethoven Center launched a fundraising campaign and purchased the item, bringing the score permanently to San Jose in September 2018. The piece is especially important because the inscribed score directly relates to an original manuscript letter in SJSU’s collection from 1817; it has a handwritten inscription that translates as “For my highly esteemed friend Antonie Brentano from the author,” the woman who is beloved to have been the composer’s “immortal beloved”; and this particular score was previously unknown until the private owner contacted the Beethoven Center. The inscription has been authenticated by Beethoven Scholars and was vetted by a well-established music antiquarian.